conifer lodges Solid Luxury offer 33 luxury self catering cosy log cabins beautifully situated in mature woodland. There are several types of Scandinavian timber lodges to choose from sleeping 2 to 8. The four Birch Lodges sleep 4 with a double bedroom and twin bedroom. Birch Lodge 12 is our dog free lodge. We also have our eight Birch Plus Lodges which are the same layout as the Birch Lodges but with the added luxury of a private hot tub. Birch Plus Lodge 18 is our pet free lodge. If you are looking for a 2 bedroom lodge, sleeping 4, with a little more space then try our exclusive Laurel Lodge with private hot tub. Laurel Lodge is also dog friendly. Our newest lodges are the five Lord Galloway Lodges which all have their own private tub and are all dog friendly. Lord Galloway 31 sleeps 6 and has a small games room whilst the remaining four Lord Galloway's sleep 8. These lodges have 2 en-suite bedrooms upstairs plus an additional shower room downstairs. Our five Primrose Lodges sleep 2 and all have their own private hot tub. We have four Conifer Plus Lodges each sleeping 4 and each with their own private hot tub. Conifer Plus Lodge 8 is our dog free lodge. If you are looking to sleep 6 then try one of our four Lady Galloway Lodges with private hot tub, these lodges have an en-suite bathroom and a family shower room. Lady Galloway Lodge 30 is our pet free lodge. New to Conifer Lodges in 2018 - Our four new 2 bedroom Squirrel Lodges are a new and exciting addition to Conifers, perfect for a family holiday with a kingsize bedroom and second bedroom with bunkbeds! These cosy lodges are well laid out for a family of four and, of course, offer the added luxury of a private hot tub. 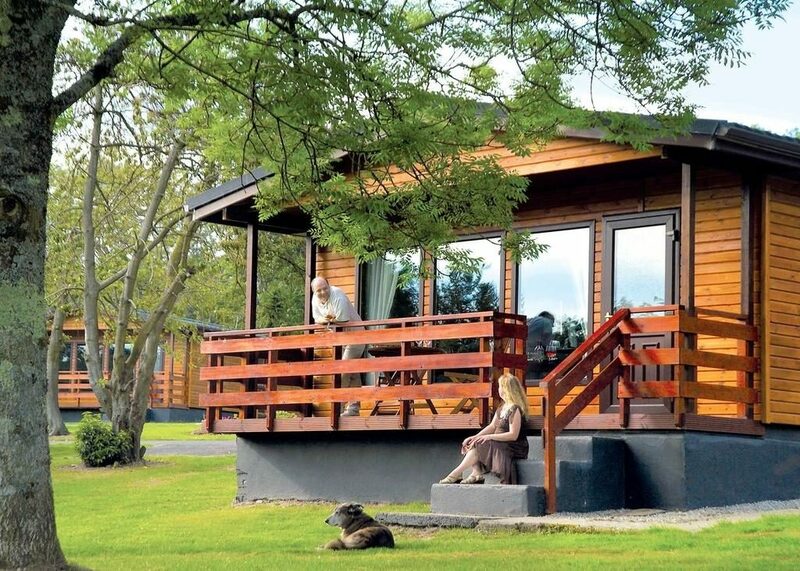 Conifer Lodges is an ideal place to escape and unwind based on the outskirts of Newton Stewart in the beautiful county of Dumfries and Galloway. With the backdrop of the Galloway Forest Park on one side and bordered by the Golf Course on the other, Conifer Lodges is the ideal base for a family holiday or a romantic break with your loved one. The forest itself is a paradise for nature lovers and within easy reach of superb fishing spots, walking and mountain biking, there really is something to please everyone. A number of our lodges are also dog friendly so please bring along all the family to enjoy the stunning scenery. As a guest at Conifer Lodges you can enjoy free fishing at Palnure Burn as well as special Golf rates at Newton Stewart Golf Club. Beautifully situated amidst mature pine woodlands, just 1 mile from the historic market town of Newton Stewart, Conifer Lodges offers you the ideal away from it all holiday base. Ideally located for exploring the beautiful surrounding area, you are within easy reach of a wealth of scenic and historic attractions.